This basic tutorial its design to be a guide for the creation of simple external incompressible 3D flow cases on OpenFOAM, it must be complemented with further reading and understanding of FEA and CFD theory and by no means this tutorial most replace the although complex yet useful documentation from OpenFOAM itself and related sources. In this case, the dummy Kilo-Class submarine model its completely submerged under water and its advancing completely straight throw the water medium. It is no common to have an small restricted medium-- boundary like in this example, the user must be careful in make the right assumptions in this type of procedure, the dimensions of the medium affects the turbulence model and may lead to unreal results. 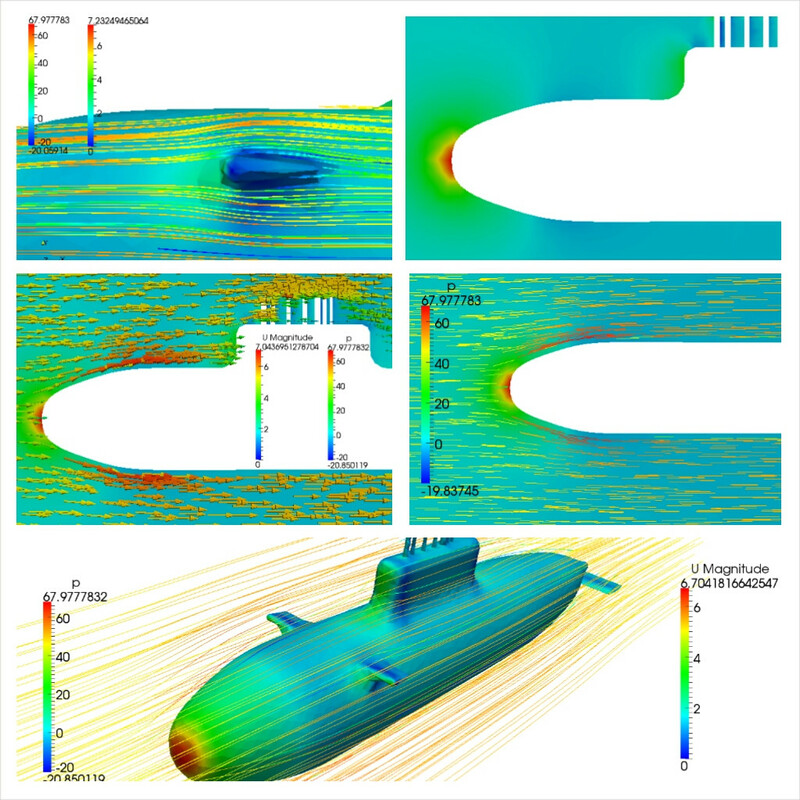 In real design process not just the hydrodynamic behavior dictates the submarine shape, it involves some deep and complex study’s which naval engineers master. This analysis its completely representative and educational due the lack of real data such as dimensions, velocity and materials properties the model has been created by merely observation and assimilation of some real cases. In this case, the dummy Kilo-Class submarine model its completely submerged under water and its advancing completely straight throw the water medium. It is no common to have an small restricted medium-- boundary like in this example, the user must be careful in make the right assumptions in this type of procedure, the dimensions of the medium affects the turbulence model and may lead to unreal results.